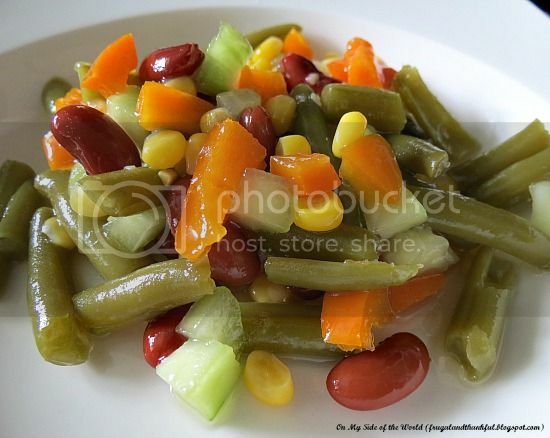 Frugal and Thankful: Two-bean salad. This was seriously the very first salad recipe I tried when I moved to the US! When we first got married, we rented an apartment in a tiny complex. Once a month they would publish a "news paper" which was literally a sheet of paper with local occasions, important information and recipes. Since I was still a brand-new wife, I was devouring ideas for dinners to please my man (OK, I still do it once in a while... That's why I have so many cookbooks...). So every time we went to pay our rent, I would pick up the paper. Well, that's the easiest part. Chop, chop, chop. Mix dressing. 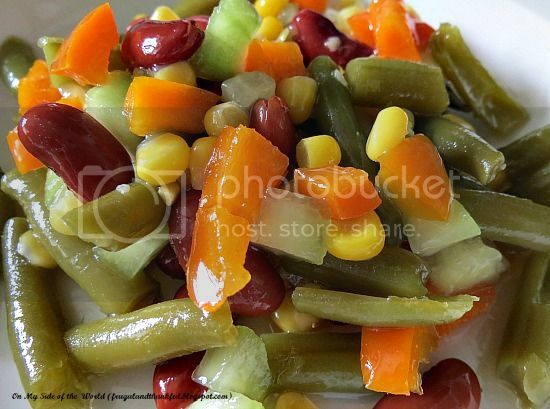 Combine in a salad bowl, cover and let it sit in a fridge for at least 2 hours or, even better, overnight. Done! Serve chilled using a slotted spoon. Salad looks tasty and something I would eat but not the family. Have you tried it with red onion? Carol, I don't even put onions because my husband hates them :) But they are in the original recipe. I think, it will be delicious with red onion. I have a husband who also does not like onions. :( A lot of recipes don't work very well if you leave them out because onion is a very strong flavor. However, this one should work well. I love your new picture off to the side! Smexy. I love easy things to make. Thank you!!! I feel a bean salad coming on. Like you I had all the ingredients and thought I would give it a try. It looked so appealing with all the different colors - I made it and trie a little bit the next day. It was so good that I had another helping immediately. This is going to be added into my recipe rotation. Thank you for sharing.